Perfect for more than just patios, Oasis Patio Shades add on-demand shade and comfort to a variety of outdoor living areas. With growing concerns about West Nile disease and now Zika virus, insect protection may be just as important as sun protection and we feel we’ve got the answer zipped up. Exterior roller shades for covering windows, decks, porches, pergolas and other outdoor patio structures under the Oasis® brand name. All our exterior roller shade systems are designed to control heat and glare while maintaining the view of the outdoors, and are the most effective shading solution for outdoor living spaces and the outsides of windows. The benefits of solar screen shades make them a clear choice for this extension of residential and commercial window treatments. Stopping the sun before it enters the glass of your windows is the most effective way of decreasing heat gain inside, and therefore reducing cooling costs. Exterior roller shades are a European concept for energy management that is gaining popularity in the United States. Insolroll has have fabric and hardware solutions for every window application. Oasis® 2600 Patio Shades with solar screen fabric provide a simple solution for shading east, south, and west facing patio areas from harsh sun. These shades utilize an exterior grade bead chain and clutch operating system. 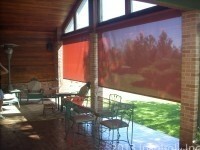 Shades are custom sized for any patio area up to 12′ wide. Oasis® 2650 Patio Sun Shades is essentially an upgrade of the Oasis 2600 shade. We provide the same bead chain and clutch operating system as the Oasis 2600 system, a cable guide system, and an optional 4″ fascia system. Custom sized shades are available up to 12′ wide. The Oasis® 2800 Patio Shade is our original design developed in 1986. Our best-selling and most versatile sun shade solution, it is available up to 19′ wide in a single shade. Motor or crank operated shades come in a 5″ x 5 1/2″ extruded aluminum headbox or exposed bracket with a choice of side tracks or cable guide system. Custom sized shades are available up to 19′ wide. The Oasis® 2900 Solar Insect Shade was designed to block the sun and keep the bugs out. These patio insect shades utilize a 5″ x 5 1/2″ extruded aluminum headbox and a zipper system inside the side track to provide a 4 sided edge seal for the shades. 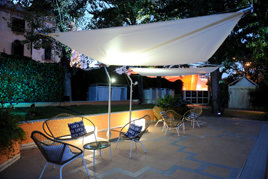 Available in solar screen, translucent enclosure fabric or insect weave fabrics. Custom sized shades are available up to 19′ wide.